Amazon is running a deal today that will totally change your life, and we’re not exaggerating. You know how you get super stressed at work sometimes? Well Amazon’s gold box deal on massagers will help you take care of that stress in no time. How can you feel stressed out while the Mynt Cordless Neck and Back Shiatsu Massager works its magic for just $29.99, with four deep-kneading nodes and built-in heat? 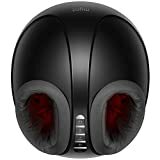 How can you worry about filing those reports on time when you’re enjoying the Mynt Shiatsu Foot Massager that you got on Amazon for $250 off retail? Definitely don’t miss these deals. Prizewinning: Recipient of the world-renowned iF Design Award (2018). Cordless: A built-in battery provides up to 2 hours of power so you can unwind anytime, anywhere. Broader Massage: 4 flattened shiatsu nodes target your body’s acupoints with wider treatment. Use from head to toe, for full-body therapy. Premium Performance: A soft, multi-layer build delivers 3D massage that’s robust, yet kind to skin. Super streamline, with warming function and single button operation. What You Get: Pillow, Charging Cable, Manual, 24-month warranty and fan favorite support. Premium Performance: Hi-tech pads, rollers, and massage technology deliver an immersive, professional-style treatment – from toes, to ankle. Tailored Technique: Choose from Japanese shiatsu or powerful air pressure – for a traditional, or modern-style massage. What You Get: Premium Foot Massager, Charger, Charging Cable, Owner’s Manual, 24 month warranty & fan favorite support.